Now that the sun is beginning to pop out occasionally, I'm trying to find things to do outdoors and places to explore. Chunk and I live an hour's train ride from central London, so one of our first trips this spring has been to the Natural History Museum and British Science Museum. Both of these museums are packed with things to do for children and adults of all ages and even better than that...they're free!!! Money is very tight in my household at the moment (when is it not?!) so finding low cost and free activities tends to be my main priority. I have been put off in the past from travelling too far due to expenses, but at the moment you can get 2FOR1 on certain days out for attractions in London as well as Brighton and Cambridge when you travel by Thameslink and Great Northern trains. I am taking advantage of this at the moment and booking up days in advance for the rest of spring and summer, because London has so many attractions that we've yet to try. Another reason I am booking these visits is for the train journeys themselves. Chunk LOVES going on the train, probably because we rarely do it so it feels like a treat. He likes staring out of the window to spot other trains and his favourite parts tend to involve going through the tunnels and hearing the driver speak over the loudspeaker. I tend to pack things to keep him entertained on the train such as snacks, a magazine and colouring books, but he rarely looks at them because he is too caught up in watching the people around him and trying to spot things out of the window (sheep and cows seem to feature a lot on the journey). 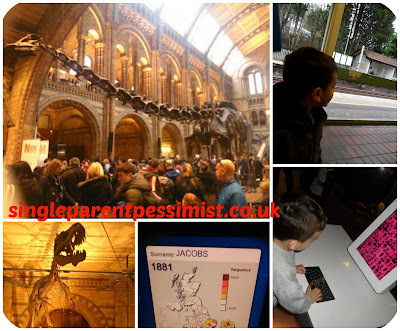 If you read this blog regularly then you will know Chunk's main passion is dinosaurs, so the Natural History Museum is perfect because it's full of real and fake dinosaur skeletons and activities. The Science Museum is also brilliant because it engages children in learning through play and interactive activities, and it even taught me a thing or two which is never a bad thing! On our next trip I plan to show Chunk other parts of central London such as Big Ben, the London Eye, Parliament and of course, Buckingham Palace. Whilst he is still quite young some of this may not appeal, but he does love huge buildings and places such as the Sea Life Centre, which are close to the Eye and Big Ben. There are also some beautiful parks that we can have picnics in and he can run off some steam with his cousin who I imagine will be coming too. What things can you recommend to do in London? I'm always up for finding out new places to visit!